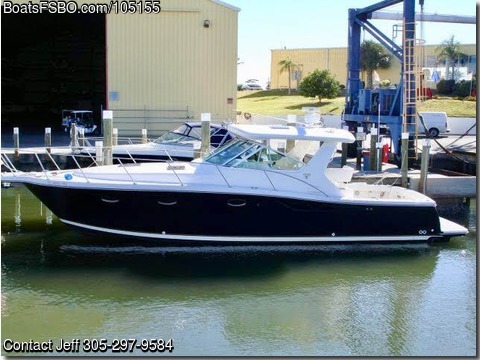 Call Jeff at 305-297-9584 or email jeffbec51@aol.com Boat located near Ft Myers, Florida. 2004 35’ Tiara “Harbor Edition “. Engines: Twin Cummins 6BTA5.9-M3 @370 HP ea. Cruising Speed 28.6knots or 32.9mph. Top Speed 31.8knots or 36.2 mph. Fuel Capacity: 360gal, Colors: Flag Blue hull and White topsides. Cabin Sole: Teak and Holly. Includes: Fiberglass Bow Pulpit, Windlass, Integrated f’glas Swim Platform, Air Con (AC/DC) reverse cyc Cool Air at helm. Island Queen Bed forward, Electric refrig w/ freezer, Microwave, Fishing: Raw and freshwater wash, Flush storage tank and Macerator, 4 Lee rod holders. Electronics: Garmin 15” model 7215 GPS Chart Plotter and 4kw Garmin Radar, Simrad depth indicator, Raymarine ST8001 Autopilot W/high speed core pack.